In this article, we explain a bit about whitebaiting and offer a few tips to help the beginner get started. Learn about how to catch whitebait. 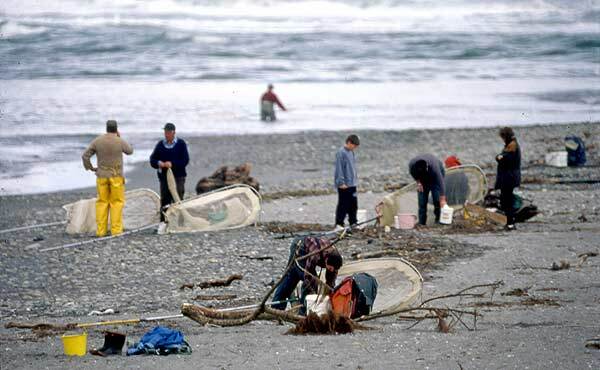 Whitebaiters at the mouth of the Hokitika River, West Coast, of New Zealand’s South Island. 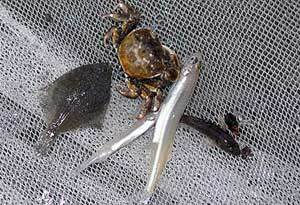 First of all, whitebait consists primarily of the young of three species: inanga, koaro and banded kokopu. The inanga is by far the most commonly caught of these. However, the young of several other species are sometimes found in the whitebaiters net. This includes: giant kokopu, short-jawed kokopu, and the bigger and more fish-like smelt or silvery. Not just whitebait in the net. Here the net has also caught a small flounder, two smelt, a bully and a grab! All these species are collectively regarded as whitebait. Sometimes white-baiters also catch in their nets: yellow-eyed mullet, trout, eels, and small kahawai. These bigger fish should be released unharmed, though the yellow-eyed mullet make good bait if you are going surfcasting. 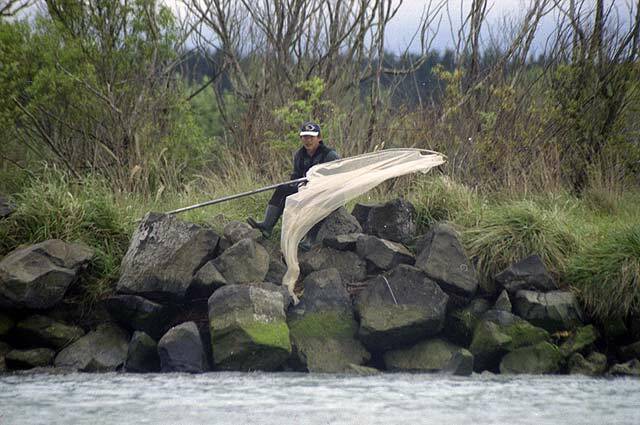 In fact, many white-baiters fishing near river mouths frequently put a bait out with a rod. Perhaps they want to catch something else to break the monotony of having to eat whitebait all the time! Whitebaiters regularly catch other items in their nets. Most of these are unwanted sticks and weeds brought down the river following rain. Anyway, all whitebait species spend part of their life cycle in the sea and part in freshwater. The whitebait’s eggs hatch in freshwater during late Autumn and are carried down the rivers and out to sea, where they live and grow over winter. In spring, now recognisable as the whitebait we catch, they head back up the rivers to mature in swamps and bush covered streams. These mature adults migrate to the lower reaches of rivers and estuaries to spawn. Their eggs remain in these areas until they hatch and are washed out to sea, so completing the cycle. 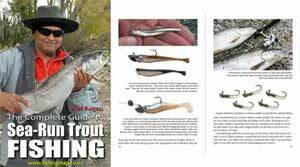 Here are DoC brochures on whitebaiting. Department of Conservation Information for Whitebaiters (all of New Zealand except South Island West Coast). Department of Conservation Information for Whitebaiters (West Coast of the South Island). In the video: Adult whitebait swimming in a shoal up the lower Waimakariri River. Adults lay eggs on river and creekside vegetation at the high water mark. The eggs hatch on the next spring tide and the larvae are washed out to sea. The juvenile whitebait considered a delicacy in New Zealand, spend the winter at sea and return to the rivers during the spring. Whitebaiters are an ingenious lot. Their nets are often partially home-made. Many have produced a whole range of gadgets and devices to help land a feed. Most of which you won’t find in a store or catalogue. These include trolleys to tote their nets and go-bys, specially adapted trailers for the same purpose, customised box and pole nets and many home-made strainers for separating bait from unwanted rubbish. 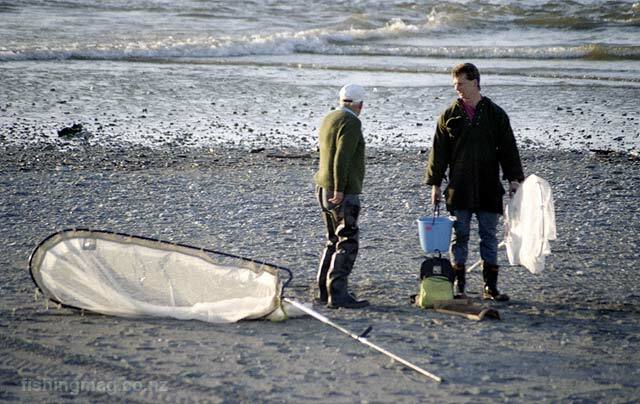 Drag netting at the Waimakariri River mouth. This method of white-baiting is popular at this river mouth because of the shallow sandy bottom. Checking the drag-net. At times you collect more leaves and sticks than whitebait. But that is all part of the fun! Whitebait will still run the river even when the river is in full flood and the water dirty brown! 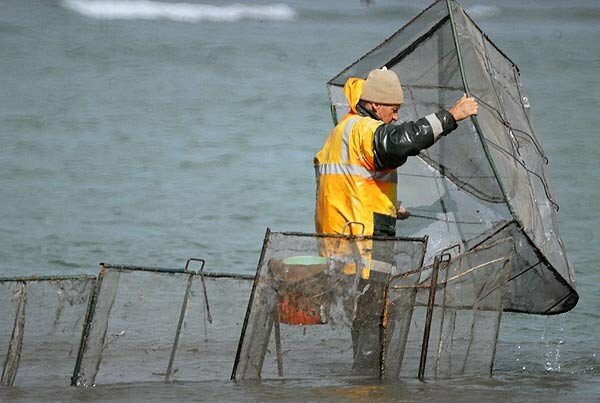 Whitebaiters drag netting for bait at the mouth of Canterbury’s Waimakariri River. 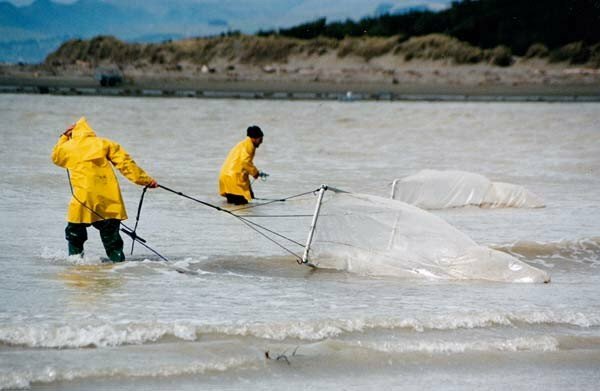 The video above: Drag Netting for whitebait at the mouth of the Waimakariri River, near Christchurch, New Zealand. About making and using a whitebait dragnet. 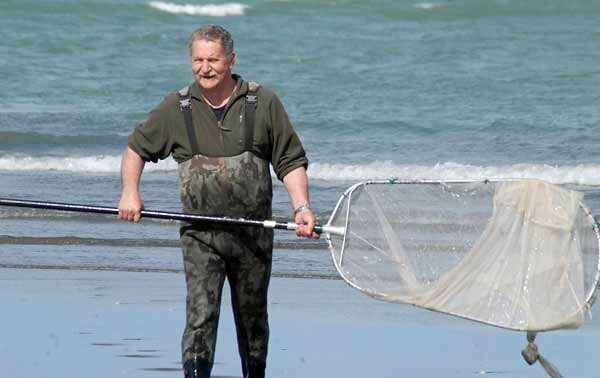 More about whitebaiting here: Drag netting in the surf at the Waimakariri River mouth is enjoyable and productive with one of these homemade nets. Whitebait costs about NZ$100 per kilo in shops so catching this delicacy yourself saves money and is great fun! Net frame is made from PVC pipe. Which type of net to use depends mostly on where you are going to fish. Dragnets are easy to use. They are pulled around by their owners through the shallow surf. This method is best suited to river mouths where the sea comes in over a shallow sandy beach such as at the mouth of Canterbury’s Waimakariri River. Their drag-nets have floats at the top to ensure they remain the right way up. 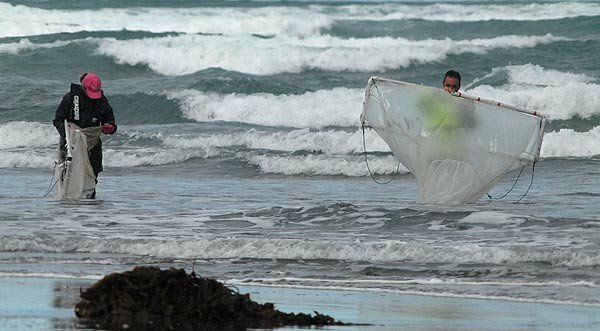 If the surf was too rough, or the drop-off too sudden, a drag-net would flip over. It would also be too dangerous. If there are many people white-baiting near the lower reaches of a river the drag netters get first shot at the bait as it moves up. The method is also quite labour intensive and requires a strong back. It can be a very productive method. It possibly also has the advantage in that no matter how many whitebaiters are in the river, there is always room for another out in the surf. In this photograph taken from my boat at the mouth of the Waimakariri River, you can see a set of go-bys (screens) in action as they guide the whitebait towards the waiting box net. Whitebaiting with a box net and go-bys (or screens) at the mouth of Canterbury’s Waimakariri River. Checking the box net at the mouth of Canterbury’s Waimakariri River. Box nets, or set-nets as they are also known, are very popular. The main reasons being that they are highly productive and, most importantly, they are a passive whitebaiting method. Although it requires some strength to empty the net, it has a big advantage that, once set up, you can sit down and read a book or listen to the radio while the net does all the work. A trap in the box net prevents the bait from swimming back out. Don’t forget that the regulations clearly state it is an offence not to remain within 10 metres of your net. Well, there are some drawbacks with box nets. If fishing the river’s tidal zone, you have to move the net backwards or forwards to prevent it from either being stranded high and dry or washed away by the tide. Whitebait freshly taken from the river is translucent. The go-bys (or screens) and net also require a bit of work to set up and cart around. This is particularly so if you want to fish a river mouth where access is restricted to four-wheel-drives or a long walk. The set net and go-bys are also the most expensive to buy. Looking at the regulations, the mouth of the net must not be greater than 4.5 metres and the total length of go-bys and net must not exceed 6 metres. You are not permitted to use this total of 6 metres length if doing so would result in your gear exceeding more than one-third of the channel width. You are also not allowed to get together with a mate on the opposite side of the channel and have the combined width of your gear, together with his, exceed more than a third of the channel width. To set up a box net you need a river bank that is stable and preferably has good sloping access. A steep bank makes fishing a box net impossible, or at the very least, forces you to do away with the go-bys (screens). Set nets and go-bys are a real hassle to cart around. A full-size box net won’t fit in the boot of your car. Therefore you’ll need a roof rack or a trailer just to get it from home to the river. There are a few folding models available that have helped to alleviate this problem a little. The author with his trusty pole net at the mouth of the Waimakariri River. The waders are essential for staying warm and dry. A pole net is the least expensive option when first starting out whitebaiting. It is the most flexible option and can be used in both in the river and surf. Whitebait pole net. Hokitika River mouth. Pole nets are by far the easiest to carry around and use. If you are a total beginner at whitebaiting a pole net is probably the best place to start. With a pole net, you can fish almost anywhere from the crashing surf to quiet tranquil streams and rivers. Not all of the long handle is used. Some of it acts as a counterbalance to the net. Pole nets are made with aluminium frames and poles so they are lightweight for their size. With the pole net, the pole is in two sections which are bolted together and then bolted to the net frame. This whole arrangement can be bolted together, or taken apart in seconds. The net together with a pair of six-foot sections of pipe is much easier to transport. Pole nets are available in a range of sizes up to the legal maximum allowed mouth of 4.5 metres. This is bigger than it sounds. A full-size pole net can be a bit difficult to manoeuvre although it must increase your chances when fishing blind into milky water. The pole net I use has a mouth of 3 metres and seems to work well enough especially in the surf where I like to use it. I have a larger one that I am going to use this season. A whitebait pole net is easily the most versatile. It can be used in any situation making it a great place to start if just getting into whitebaiting. Here a whitebaiter waits for a shoal of bait to come into view. I have had some good catches with my pole net along this section at McIntosh’s Rocks, on the Waimakariri River. You need a long pole to reach the water from the bank but it is worth the effort. 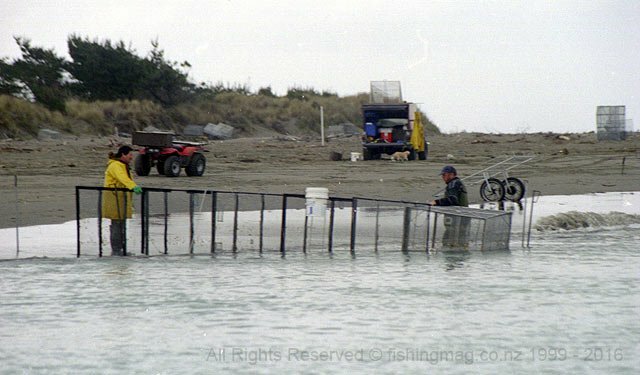 Whitebait scoop netting at the mouth of the Rakaia River, Canterbury. Note everyone is wearing a lifejacket. This is the riskiest style of whitebaiting. Never turn your back on the sea. Every so often a much bigger wave rolls in that can easily catch you unaware! 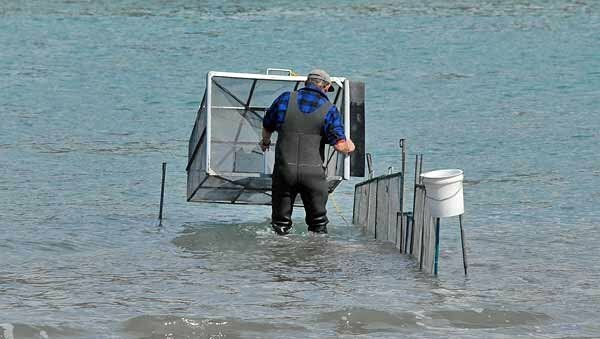 More about whitebait cleaning screens on this page. 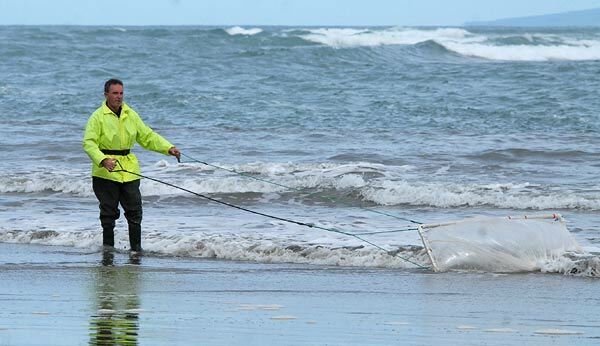 There are some specialist pole nets available that, believe it or not, are used to fish the crashing surf on shingle beaches such as at the mouth of the Rakaia River. These nets have short poles and small mouths to allow them to catch the waves. The net is rigid like a miniature box net on the end of a short pole. The method is obviously somewhat dangerous and I don’t recommend you try it if just starting out as a whitebaiter. For those who do a life-jacket is a sound investment. Most white-baiting is a hit and miss affair. Nets are dipped into milky water and fished blind. With the pole net, it is possible, when the water is clear, to actually see the bait coming and scoop them up. This works well in sedate rivers. White sight-boards are placed on the riverbed. When the bait is spotted moving over the board the net is lowered into the water ahead of the shoal to scoop them up. Mostly, however, the water is seldom clear enough for this. A chop on the water or strong glare also makes it difficult, though Polaroid sunglasses are a big help for seeing the bait. The pole net can be used while standing in the same spot and fished blind, or you can walk downstream as the tide is coming in. This keeps the sock flowing out the back as the bait swim upstream. You can also use your pole net in the surf by just moving it quietly along in the direction of the waves. 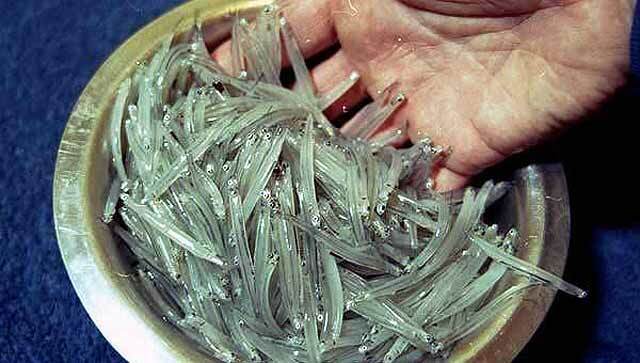 On the West Coast, the mouths of the main rivers are very popular during the whitebait season. Whitebaiters walk a beat sometimes up to 100 metres long. 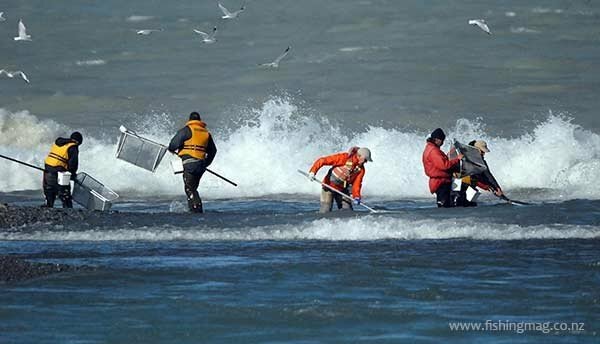 They start upstream and work their way down with their pole net at a steady pace. They then lift their nets from the water and walk back upstream to the rejoin the queue. This gives everyone the same opportunity to fill their bucket. These sort of customs appear strange to white-baiters from other parts of New Zealand. Particularly if there are dozens of white-baiters just standing in the queue and not white-baiting at all, as they wait their turn! 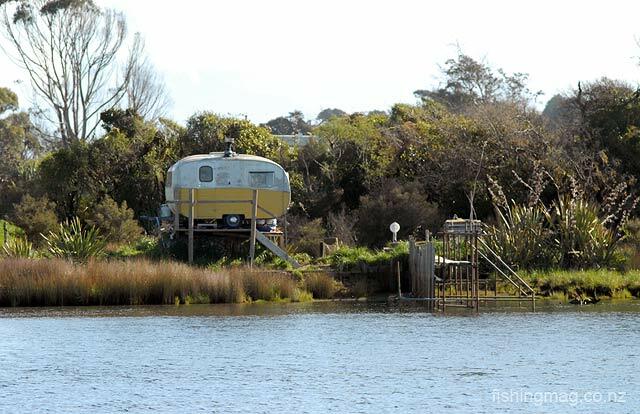 Turnbull River, South Westland, whitebaiter’s caravan. There is something iconically Kiwi in this scene taken just inside the river mouth lagoon. Photo: Allan Burgess. A decent pair of neoprene waders is a must for white-baiting. The season begins while there are still frosts on the ground and heavy snow on the Southern Alps. The water is very cold. For this reason, whitebaiters are the biggest buyers of fishing waders in New Zealand. You need chest high waders for whitebaiting because you have to wade out with a margin for preventing water from coming over the top of your waders and down your legs. Ideally, you should have your waders custom fitted. If the shop doesn’t offer a custom fitting service go somewhere else. There is nothing worse than waders that don’t fit properly. Remember that too big is just as bad as too small a fitting. Such waders will wear quickly and be uncomfortable to wear. Essential items in the whitebaiters kit are a bucket and strainer. These range from sophisticated home-made stainless steel models on a stand to the less expensive as. 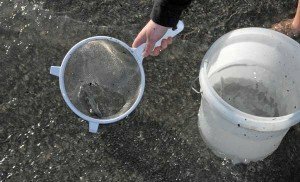 Most whitebaiters have their bucket half full of water so that their bait can swim around. The water also acts as a weight to prevent the bucket from blowing over in the wind. A bucket and strainer are essential tools for the whitebaiter. Many white-baiters allow their catch to swim around in a bucket of water. This is fine if you are only going to be a few hours. If you intend staying at the river for much longer it is a bad idea to keep them this way as they soon die. The best idea is to drain them well with a kitchen colander. And keep them in a bucket with a lid over it, and store them in a cool place. Whatever you do don’t place them in a plastic bag for the day or they will heat up and be cooked by nightfall. The Whitebaiters Guide to Whitebaiting on the West Coast. The best whitebait fritters contain nothing but whitebait. Just butter in the pan to stop them sticking. Maybe if you have had a bad day you can thin the mixture with the addition of an egg. But I think the addition of flour means you’re headed downhill. There is nothing as good as a feed of whitebait you caught yourself. Give it a try. 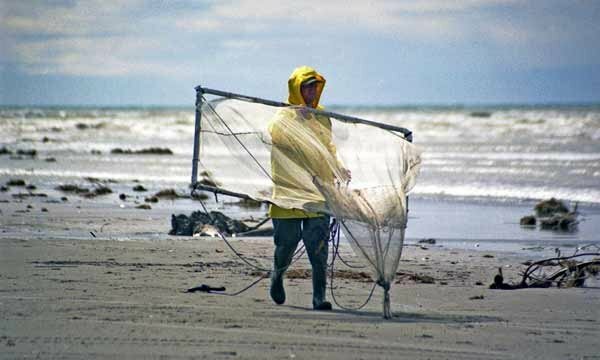 Above: a short video showing set netting at the mouth of Canterbury’s Waimakariri River. Here is a good recipe for whitebait fritters. Above: a short video showing a pole net in use at the mouth of Canterbury’s Waimakariri River.